In 1968, James Watson published “The Double Helix”, a personal account of the history of the race to discover the structure of DNA. The book was controversial and bracingly honest, a glimpse into the working style and personalities of great scientists like Francis Crick, Lawrence Bragg, Rosalind Franklin and Linus Pauling, warts and all. The vividness of Watson’s recollections and the sometimes almost minute-by-minute account make his memoirs a unique chronicle in the history of scientific autobiography. After Watson’s book had been published, the physicist Freeman Dyson once asked him how he could possibly remember so many details about events that had transpired more than a decade ago. Easy, said Watson: he used to write to his family in America from Cambridge and had kept all those letters. Dyson who had been writing letters to his parents from the opposite direction, from America to Cambridge, asked his mother to keep all his letters from 1941 onwards. 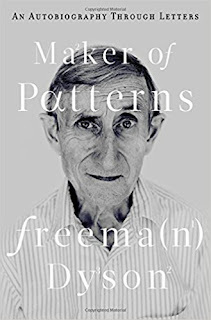 The result is “Maker of Patterns”, a roadside view of the remarkable odyssey of one of the finest scientific and literary minds of the twentieth century. Letters are a unique form of communication, preserving the urgency and freshness of the moment without the benefit and bias of hindsight. They recall history as present rather than past. One wonders if the incessant barrage of email will preserve the selective highlights of life that letters once preserved. Dyson’s letter collection was initially titled “The Old One”. The allusion was to a famous letter from Einstein to Max Born in which Einstein noted his dissatisfaction with quantum theory: “Quantum mechanics demands serious attention. But an inner voice tells me that this is not the true Jacob. The theory accomplishes a lot, but it does not bring us closer to the secrets of the Old One. In any case, I am convinced that He does not play dice”. Publishers sometimes change titles to suit their whim. Perhaps the publisher changed the title here because they thought it was presumptuous to compare Freeman Dyson to God. I would concede that Dyson is not God, but it’s the metaphor that counts; as these letters indicate, he is certainly full of observations and secrets of the universe. The letters contain relatively little science but lots of astute observations on people and places. Where the science does get explained one senses a keen mind taking everything in and reveling in the beauty of ideas. Dyson’s letters begin in 1941 when he was a seventeen-year-old student in Cambridge and his parents were in London. They talk about mathematics, mountaineering and the state of the Second Word War. Freeman’s father was a renowned composer and conductor and his mother was a successful lawyer and promoter of women’s suffrage. It seemed to everyone that it was a miserable time to be alive. Hitler had just attacked England the year before and the entire country was suffering from bombing. Cambridge was hollowed out and only a few professors and students were left. The advantage of this situation was that you could learn at the feet of the masters, or in Dyson’s case, around the billiard table. The billiard table belonged to Abram Besicovitch, a brilliant and voluble Russian mathematician who was a formative influence on young Dyson; Dyson used to go on long walks with him on which Besicovitch insisted that the young student speak only in Russian. This solidified a lifelong love of the Russian language in Dyson. He used to usually find Besicovitch and Hardy at the billiard table. In the letters he discusses everything with them, from mathematics to politics. He enjoys attending all their lectures: “Dirac is very slow and easy to follow; Pars and Besicovitch a bit quicker, but still comfortable; Hardy goes like an avalanche and it is all I can do to keep up with him. One learns about three times as much from Hardy in an hour as from anyone else; it is a testing business keeping the thread of his arguments.…”. What Dyson does not mention but what he evocatively described in another volume was the image of Hardy huddled up in his rooms with six students sitting around the table and Dyson feeling that he should just go and hug the old man. At one point he’s appointed “staircase marshal, which means I have to look after my staircase, put out bombs and carry out corpses”. Fortunately all he had to do was operate a fire pump. During the war, Dyson spent his time first studying at Cambridge and then working for Bomber Command on the bombing campaign over Germany. This was a rather dismal experience, a classic case of muddle-headed bureaucracy winning over saving lives. No letters were written during this time since Dyson used to visit his parents once a week, but he has documented this experience well in his wonderful memoir “Disturbing the Universe”. But there was still mathematics to do. There is mention of getting a manuscript of Kurt Gödel’s and of listening to John Maynard Keynes on uncovering Newton’s astonishing secret work on alchemy and religion which cast him in the light of a magician rather than a rational scientist. On Gödel’s manuscript on the continuum hypothesis, “I have been reading the immortal work (it is only sixty pages long) with [Thomas Mann’s] “The Magic Mountain” and find it hard to say which is the better.” After the war ended, Dyson made his way to Münster, Germany, to a meeting between German and British students to rekindle old relationships. He captures the drama of destruction and the resilience of the citizens in this old city; people even organize makeshift classical music performances among the ruins. There is a brief platonic romantic meeting with a girl who quotes Yeats and warns Dyson to “tread softly, for you tread on my dreams”. Dyson’s journey toward scientific greatness started when he came to America at the recommendation of Geoffrey Taylor, a well-known hydrodynamics expert who had worked on the bomb at Los Alamos. When Dyson asked him what place he should consider for his PhD studies, Taylor unhesitatingly recommended Cornell University, adding that that’s where all the bright people had gone after the war. This statement was not an exaggeration. Cornell boasted a star-studded constellation of physicists including Hans Bethe, Richard Feynman, Robert Wilson and Philip Morrison. Dyson was assigned to Bethe as a PhD advisor. His first impression of Bethe was characteristic: “Bethe is an odd figure, large and clumsy with an exceptionally muddy old pair of shoes. He gives the impression of being clever and friendly but rather a caricature of a professor; he was second in command at Los Alamos, so he must be a first-rate organiser as well.” And indeed he was. Bethe who was one of the greatest scientific minds of the century had a great ability to pitch problems to every student based on their capabilities; Dyson was undoubtedly the best student he had. Bethe does figure in Dyson’s accounts, but the real attraction is the young Richard Feynman. Feynman had come from Los Alamos, leaving behind memories of the untimely death of a beloved wife. He was trying to put his life and physics back together and had visions of a new physics of particles and fields that he was constructing from scratch. Dyson was taken by this very American scientist from the very beginning. “Feynman is a man for whom I am developing a considerable admiration; he is the brightest of the young theoreticians here and is the first example I have met of that rare species, the native American scientist…His most valuable contribution to physics is as a sustainer of morale; when he bursts into the room with his latest brain wave and proceeds to expound it with lavish sound effects and waving about of the arms, life at least is not dull.” He later understood Feynman’s tempering through tragedy; both because of his wife’s early death and his experience with the bomb, he had matured beyond his years. Another one of Dyson’s heroes was Philip Morrison who not only had large stores of knowledge about virtually any topic under the sun, but also equally large stores of integrity that allowed him to withstand the onslaught of McCarthyism and refuse to rat out his friends. There was tea in the British tradition, and parties where Oppenheimer charmed everyone with his dazzling range of scientific, literary and culinary knowledge. A memorable occasion was when Morette convinced a shy T. S. Eliot who was visiting to join the group of young scholars. Another memorable episode was when a drunk Adele, Kurt Gödel’s wife, grabbed Dyson and made him dance with her while an awkward Gödel stood around looking miserable. Gödel was a brilliant, strange man who had discovered the incompleteness theorem, one of the most startling and important results in the history of mathematics and logic. He was loath to engage in casual conversation; only Einstein who adored him and who walked home with him every day was his friend. And yet Dyson seems to have visited the Gödels several times and found Kurt friendly. Dyson’s profile of Oppenheimer is the most penetrating of anyone’s in the volume. He saw Oppenheimer’s self-destructiveness and self-loathing which translated into casual cruelty. As memorably recounted in his memoirs, Dyson had just finished a marathon road trip with Feynman across the American South and Midwest during which he had come up with his most famous contribution to science: a bridging together and reinvention of two competing theories of quantum electrodynamics, the theory of light and matter, by Feynman and Julian Schwinger. The epiphany had come to him during a bus ride from Albuquerque to Chicago, right after he had been out west and painted some evocative pictures of America; the Ozarks with their beautiful mountains and crushing poverty, the slums of Philadelphia, flash floods in Oklahoma, Melvin Calvin doing Nobel Prize-winning experiments on the path of carbon in photosynthesis in Berkeley. After he came back his job was to convince Oppenheimer. This turned out to be a nasty little uphill battle. The chain-smoking Oppenheimer used to constantly interrupt speakers with derisive remarks, and Dyson captured his defects well: “I have been observing rather carefully his behaviour during seminars. If one is saying, for the benefit of the rest of the audience, things that he knows already, he cannot resist hurrying one on to something else; then when one says things that he doesn’t know or immediately agree with, he breaks in before the point is fully explained with acute and sometimes devastating criticisms, to which it is impossible to reply adequately even when he is wrong. If one watches him, one can see that he is moving around nervously all the time, never stops smoking, and I believe that his impatience is largely beyond his control.” After Dyson had tried several times to explain his synthesis of Feynman and Schwinger’s theories to Oppenheimer, Hans Bethe came down from Cornell and intervened. As Dyson recounts, he told Oppenheimer and the others that they needed to use Dyson and Feynman’s methods if they wanted to avoid talking nonsense. Bethe’s authority combined with Dyson’s accomplishment finally swayed minds. The next day Dyson found a note from Oppenheimer in his mailbox inscribed with a single phrase – “Nolo contendere”, or “I plead no contest”. From then on Dyson’s star was on the rise. At important meetings his work was praised by Feynman, Oppenheimer and others. Colleagues and even reporters thronged him, and job offers came flying from left and right. Dyson spent two years in Birmingham to complete the requirements of the fellowship that had brought him to America. Then Feynman left Cornell for Caltech and Bethe recommended him for a position at Cornell. Before he was thirty, Dyson had been elected a fellow of the Royal Society and had become a full professor at Cornell. He did important research in particle physics, but – partly encouraged by a devastating critique of his work by Enrico Fermi in Chicago - he also wisely realized that his interests were not in pursuing one line of research for a long time and teaching students. Oppenheimer had already indicated that he would welcome him for a permanent position at Princeton. In the meantime, Dyson had fallen in love. Verena Huber was an accomplished mathematician who Dyson had met at the Institute earlier: “I will not make this a long letter, because in these last days my mind has been completely occupied with problems even more incommunicable than those of mathematical physics. In short, I am in love.” He was as taken by her two-year-old daughter Katrin as by Verena. Dyson’s relationship with Katrin marked the beginning of a delightful lifelong affinity for children; he has had six children and sixteen grandchildren. By the time he made his way to Cornell, two of his children on the way – George and Esther. When Oppenheimer invited him to Princeton, the allure of intellectual freedom and job security for himself and his growing family beckoned, and Dyson accepted. Dyson has been a fixture at the institute in Princeton ever since then, although now and then he has expressed some ambiguous feelings about the ivory tower sheen of the place which has marketed itself as, in Oppenheimer's words, "an intellectual hotel". The next few years saw Dyson ranging far and wide over mathematics, physics and engineering, a trait which has made him one of the most unique and wide-ranging thinkers of his time. He worked in Berkeley on solid-state physics and in La Jolla on a nuclear powered spaceship and a safe reactor. The nuclear powered spaceship was a lifelong dream, and one which briefly possessed Dyson like a spell: “You might as well ask Columbus why he wasted his time discovering America when he could have been improving the methods of Spanish sheep farming.” The project was housed on a bluff with spectacular views of the Pacific in La Jolla, and Dyson vividly recounts excursions to a glider club on the cliff. He made a trip to the Soviet Union which after the death of Stalin wanted to establish better relations with the United States. He succeeded admirably in taking care of his children and in bearing the blow of a divorce, partly because he got along with children so well and partly because of Imme Jung, a young caretaker and daughter of a country doctor from rural Germany who had come to look after the children even before Verena left Freeman. This was a very fortuitous development; both the children and Freeman became so attached to Imme that Freeman and Imme got married. Gradually she became fondly integrated into Dyson’s community of friends and colleagues and formed a great partnership with Freeman. They remain happily married sixty years later. But George turned out to have an independent streak that was perhaps too independent for his own good. As a teenager he started hanging out with the wrong gang, doing drugs and turning into a hippie. Freeman was not willing to toe the boundaries here, and once when George was arrested for illegal possession Freeman refused to bail him out so that he would learn a lesson. After this George became sullen and withdrawn while Esther went off to Harvard as a confident feminist. George finally decided to stake it out on his own, hiking through the Midwestern wilderness and finally making his home in the sublime coastal country of British Columbia, living in a tree for three years, building canoes in his spare time and making friends with the rustic natives who have made that part of the country their home. The sixties saw an important evolution of Dyson’s life as he moved from pure physics to applied problems, especially problems of war and peace. He had gotten into the fray during the negotiations that led to the limited test ban treaty banning nuclear tests anywhere but underground. During this debate Dyson was pitted between his old friend Hans Bethe and his new friend Edward Teller, but his friendship with both men escaped unscathed. He was elected to the chairmanship of the Federation of American Scientists that was involved in important issues related to national policy. He became a member of JASON, a crack team of scientists advising the US government on defense problems. And he also joined the Arms Control and Disarmament Agency, an organization that was formed under President Kennedy’s authority to study disarmament. Dyson found himself working in Washington DC during the early part of the decade. The next few letters contain items various and sundry; meetings with various scientists like Yuval Neeman and Abdus Salam, accounts of Dyson’s interactions with friends including Leo Szilard and his wife Gertrude Weiss and with Einstein’s formidable secretary Helen Dukas, the death of Dyson’s father – there is a short but touching letter acknowledging his friendship with so many people and not just his stature as a musician – and organizing a sixtieth birthday event and then, in 1967, a funeral for Oppenheimer. It is clear from the letters that Oppenheimer’s influence on Dyson was considerable, and Dyson clearly understood both his deep flaws but also his fundamental greatness. He poignantly talks about how, just before Oppenheimer’s death, his wife Kitty desperately asked Dyson if he could work with Oppenheimer on a piece of physics to lift his spirits. But Dyson realized that the best thing he could do at that point was to hold Robert’s hand. The early 70s saw Dyson as a veteran scientist, advisor and thinker, sagely advising younger members of the institute in Princeton. He saw himself as a ‘psychiatric nurse’, taking care of young minds who were facing anxiety or depression because of the immense pressure to perform and produce groundbreaking science in their twenties. He recounts two stories, one of which is strange and the other harrowing. The strange story is about a historian of physics named Jagdish Mehra who was accused of stealing and then returning a letter from Einstein without the permission of Einstein’s ferociously loyal secretary Helen Dukas. Mehra later became a distinguished biographer of Feynman, Schwinger and other famous physicists. The harrowing incident was about a Japanese visiting student who committed suicide. Dyson who felt a measure of guilt in not perhaps being attuned to the signs decided to accompany his distraught wife back to Japan, and things got a bit difficult in the air when she loudly started accusing Dyson of murdering her husband and wishing death on his family. These accounts of Dyson’s experience as a psychiatric nurse attests to the enormous pressures that young scientists face at elite institutions. The late 70s conclude the letter collection. They mark a transition period in Dyson’s life, marked by two events. The first was the death of his mother at age ninety-four. Dyson wrote a moving letter to his sister Alice, imagining how his mother’s sharply observant spirit would be watching over all of them and making sure they stayed on the right track. The second event was a trip to British Columbia to mend the rift with his son George. In Vancouver the Dysons were joined by Ken Brower, a writer who would later write an evocative book called “The Starship and the Canoe” about the father-son relationship. Interspersed with these experiences are meetings with Carl Sagan and Edward Wilson and a citizens’ meeting in Princeton debating a potential ban on recombinant DNA research at Princeton University. The meeting showed how important it is to involve ordinary townsfolk in decisions affecting public policy, and how intelligent ordinary townsfolk are in enabling such decisions. On the Vancouver coast Freeman encounters whale worshippers whose “love for the animals has the passionate purity of a religious experience”. He feels the primitive harmony of whale song in the infinite silence of the night, observes George building kayaks and sails with him and meets George’s friends who are all perfectly tuned to the rhythms of nature. About two friends who taught George canoe building, one of them crippled, who walk into the rain holding a baby in their arms, “It was pitch dark when Jim and Allison left. I watched them walk slowly down the beach to the boat, in the dark and pouring rain, Jim on his crutches, Allison carrying the baby in her arms. It was like the last act of King Lear, when the crazy old king and his faithful daughter Cordelia are led away to their doom.” Fortunately, Dyson’s view of Jim turned out to be wrong. He patched up his injuries and still spends his time patching up boats. There is a metaphor for the future here somewhere. Even though the letter collection concludes in 1978, Dyson continued to be immensely valued as a scientist, writer and thinker from the 80s all the way up to the present. As of 2018, at age ninety-four, the Old One continues to speak and write on a variety of topics and continues to be nurtured by Imme, his six children and sixteen grandchildren. George and Esther are leading thinkers, writers and activists themselves, and all the other children lead productive lives as citizens, spouses and parents. He has said on multiple occasions that family, friends and work are the most important things in his life, in that order, and the letters reflect these priorities; I would wager that the word "friend" appears more often in this volume than any other. Since the nineties, when email replaced letters as the chief mode of communication, Dyson has carried out an extended correspondence with friends all around the world. For eight years, both virtually and in person, I have been honored to be one of them. Along with this volume, two other books by or about Dyson deserve to be read. One of these is his autobiography, “Disturbing the Universe”, which remains the most eloquent, literary and passionate testament by a scientist concerned with human problems that I have read. “Disturbing the Universe” was written in 1979, and it marked Dyson’s transition from being mainly a scientist to being mainly a writer. The memories in that volume complement or overlap the ones in this, and it also contains interesting thoughts on fascinating topics that Dyson didn’t really discuss with his parents; nuclear power, genetic engineering, extraterrestrial life. The second volume is “Dear Professor Dyson” which recounts more than twenty years of correspondence that Dyson has carried out – first through letters and then through email – with undergraduate students at Southern Nazarene University. Those letters also range over a bigger variety of topics and cover important matters like the ethics of defense and the relationship between science and religion. 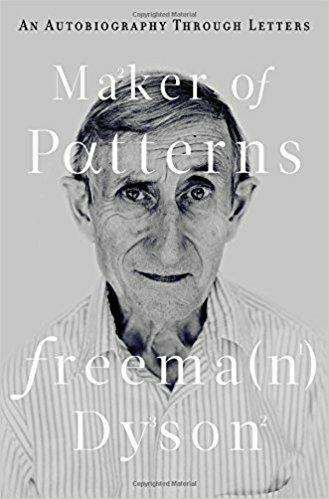 Freeman Dyson has lived an extraordinary life through momentous times, populated with extraordinary characters and remarkable ideas. The letters in this collection tell us how, and Dyson’s life as described in them is perhaps best captured by something he said a long time ago: “We are human beings first and scientists second, because knowledge implies responsibility." This is my latest monthly column for the website 3 Quarks Daily.